Whether you are thinking of a complete kitchen remodel or simply an upgrade for 2019, you need to know about how to do it properly. It is all about making your space your own with the newest (or emerging) styles in materials, textures, colors, or patterns. These 10 trending designs for kitchen upgrades are set to overtake 2019, so pay attention. The old is made new again with a throwback to simpler times to make your kitchen warm and soothing. Warm yellow backsplashes, light hardwood floors, slab cabinets, and granite countertops give off a faint suggestion of the 70s kitchen. The idea is to make use of a warm color palette to make your kitchen welcoming to all and sundry. Pastels are not often associated with kitchens, but there is something to be said for being somewhat between and betwixt popular neutral and daring bold when it comes to color. For 2019, consider incorporating pastels into your design. You might want to paint one wall your favorite pastel hue such as baby pink to give it an interesting accent and make an easy update. These shades go well with neutral and natural colors. A blue kitchen has been gaining popularity for some time, and it seems it will continue to 2019. It may have something to do with the many positive emotions associated with blue, primarily that of calmness and serenity. Light blue inspires creativity. Sky blue makes people feel relaxed and safe. Blue is also a favorite color for workspaces because it increases productivity. When considering blue for your kitchen, there is no reason to go overboard. You can have dark blue cabinets and shelves with white marble or quartz countertops and backsplashes for a nice contrast, for example. Wood has always been a popular material for kitchens, especially for cabinets and floors. However, most people have small kitchens that look even smaller in the presence of dark wood. For your 2019 kitchen, you want to choose wood or veneers in the lighter shades, such as blonde wood, and use darker or bolder colors as accents. Large kitchens are a luxury enjoyed by a few, and so are fixed full kitchen islands. If you have a small space, or would rather keep your kitchen open, you might want to consider choosing a mobile kitchen island over fixed ones. More homeowners today are realizing the advantages of having workspace on wheels they can convert to a portable bar or rolling banquet whenever they want. A custom island on locking wheels with a granite or granite countertop can be any size and configuration you want and can serve many functions for work and play. While kitchen base cabinets will always be necessary for a fully functional kitchen, the trend for open shelves in lieu of wall cabinets are likely to remain strong in 2019. This is especially true for smaller kitchens, as open shelves make any room look airier and more spacious. Of course, this depends on a homeowner’s penchant for display and décor in the kitchen. If you have some nice collectible crockery or kitchen tools, open shelves are something you need to incorporate into your design, preferably floating ones you install before the backsplash to avoid damage. You can keep some wall cabinets in place for less decorative items in the kitchen. Flat cabinets have been trending for some time. The lack of busy work and embellishments give them a sleek, modern look that can significantly update any kitchen. Swap out your recessed panel and Shaker cabinet doors with flat ones and you are good. A variation to this trend is to put small plain knobs or handles on flat doors. You keep the clean look but avoid getting your cabinet doors dirty or scuffed. Form and function in perfect harmony. Kitchen trends for 2019 are all about thinking outside the box. Classic Shaker cabinets continue to be a favorite with homeowners, and there is no reason to swap them out if you feel that flat-front cabinets are just not your style. Update the look by painting the base cabinets a different color than the wall cabinets. An interesting trend we are likely to see more of in 2019 is the use of oxidized and polished metal components in the kitchen. Well-worn copper pans, brass fixtures, and gleaming steel give rustic or country kitchens a cozy, lived-in look. This is a good time to go scouring yard sales to add just the right metal accent to your kitchen. One of the most exciting things to happen to kitchens is the integrated sink. This is a sink with a built-in countertop, or a countertop with a built-in kitchen of the same material. 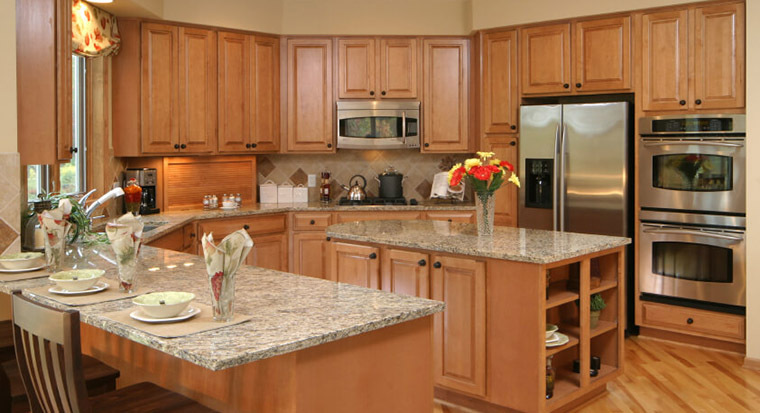 You have your choice of granite, marble, quartz, concrete, and a host of other materials. It is new, but it works well even in traditional style kitchens, as it is available in farmhouse-style sinks. It gives your kitchen a wonderfully seamless look and increases your efficiency in the kitchen as well. The only drawback is that integrated sinks are quite pricey, and available in limited styles. However, you can be sure it will make your kitchen stand out. You can use these trends as inspiration for your kitchen upgrade, but ultimately, the final design will depend on your personal preferences and needs. Your remodeling contractor can help you make your choices. GBC Kitchen and Bath is just the company you need. When you contact us for your planned remodel, the first thing we will do is give you a free design consultation and quote, so you are already ahead without spending a dime. We can promise the best customer service, expert fabrication and installation, and speedy execution of any project so that you stay on budget and the project stays on deadline. You will never get that from big box stores. Contact us today to get a free quote for your kitchen design and upgrade needs.